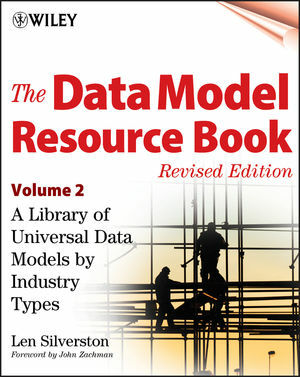 Industry experts raved about The Data Model Resource Book when it was first published in March 1997 because it provided a simple, cost-effective way to design databases for core business functions. Len Silverston has now revised and updated the hugely successful First Edition, while adding a companion volume to take care of more specific requirements of different businesses. Each volume is accompanied by a CD-ROM, which is sold separately. Each CD-ROM provides powerful design templates discussed in the books in a ready-to-use electronic format, allowing companies and individuals to develop the databases they need at a fraction of the cost and a third of the time it would take to build them from scratch. With each business function boasting its own directory, this CD-ROM provides a variety of data models for specific implementations in such areas as financial services, insurance, retail, healthcare, universities, and telecom. LEN SILVERSTON (lsilverston@univdata.com) is founder and owner of Universal Data Models, LLC (www.universaldatamodels.com), a Colorado-based firm providing consulting and training for helping enterprises customize and implement "universal data models" and develop holistic, integrated systems. Mr. Silverston has over 20 years' experience in delivering data integration, database and data warehouse solutions to organizations. Using the Industry Models in the Real World. Appendix A: Entities and Attributes for Manufacturing Models. Appendix B: Entities and Attributes for Telecommunications Models. Appendix C: Entities and Attributes for Health Care Models. Appendix D: Entities and Attributes for Insurance Models. Appendix E: Entities and Attributes for Financial Services Models. Appendix F: Entities and Attributes for Professional Services Models. Appendix G: Entities and Attributes for Travel Models. Appendix H: Entities and Attributes for E-Commerce Models. Appendix I: List of Entities and Their Associated Figures. How to Use the Volume 2 Industry Electronic Products. There should be a 1:M relationship from PARTY to DEPLOYMENT. The relationship from INVENTORY ITEM to PARTY does not account for PARTY. The figure shows PARTY FACILITY entity. It should be named FACILITY ROLE. CASUALTY INSURANCE should be CASUALTY INSURANCE POLICY. In the last sentence the text is, "In this instance, the FUNCTION SETTING"
It should be: "In this instance, the FUNCTIONAL SETTING"
In LOGIN ACCOUNT HISTORY, in the rows for both CURRENT USER ID and USER ID, 3rd column (last column) value should be "short varchar" instead of ID. In USER LOGIN in the row that shows CURRENT USER ID, 3rd column (last column) value should be "short varchar" instead of ID. Remove the references to v1:2.11, v2:4.2 for PARTY FACILITY. Keep the reference to v2:3.3 for PARTY FACILITY. Missing relationship from DEPLOYMENT to FACILITY. Need to add a relationship showing that a DEPLOYMENT is located at a FACILITY and that a FACILITY may be the location for a FACILITY. Insurance model: Missing subtype relationship of EMPLOYEE to PERSON ROLE. Add keys of party id and role type id to EMPLOYEE table. Insurance model: Missing subtype relationship of INSURANCE AGENT to PERSON ROLE. Added keys of party id and role type id to INSURANCE AGENT. Insurance model: Missing subtype relationship of INSURANCE SUPPORT STAFF (with its subtypes of CLAIMS ADJUSTOR and OTHER STAFF) to PERSON ROLE. Added keys of party id and role type id to INSURANCE SUPPORT STAFF as well as to CLAIMS ADJUSTOR and OTHER STAFF. Insurance model: Missing PARENT ORGANIZATION. Added table PARENT ORGANIZATION with keys of party id and role type id. Insurance model: INDIVIDUAL HEALTH CARE PROVIDER is not shown as a PARTY ROLE. INDIVIDUAL HEALTH CARE PROVIDER should be a subtype of PERSON ROLE and include its keys of party id and role type id. Insurance model: Relationship from SETTLEMENT ROLE TYPE to PARTY should be from SETTLEMENT ROLE to PARTY. Relationship from SETTLEMENT ROLE TYPE to PARTY should be from SETTLEMENT ROLE to PARTY and thus there should be a "role type id" attribute in SETTLEMENT ROLE. Insurance model: SETTLEMENT ROLE TYPE doesnt have the subtype relationship to ROLE TYPE. SETTLEMENT ROLE TYPE should be a subtype of ROLE TYPE and thus should have a "role type id" attribute. Financial services model: Relationship of "PARTY OBJECTIVE to OBJECTIVE TYPE" is non-identifying. Relationship of "PARTY OBJECTIVE to OBJECTIVE TYPE" should be identifying.